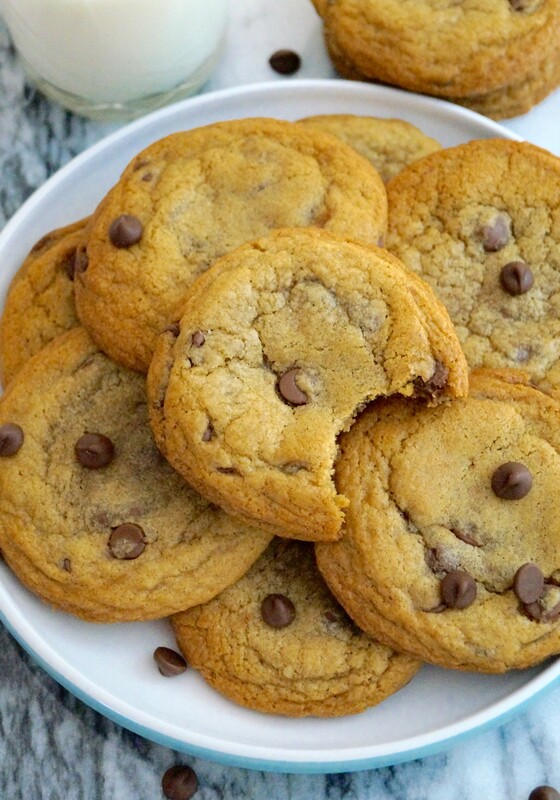 Classic chocolate chip cookies. Soft, chewy and totally addictive! Cookies are one of my food guilty pleasures, I love going back-to-basics and I thought it was about time share my go-to cookie recipe, jam packed full of gooey chocolate chips! I cannot think of anything more delicious! 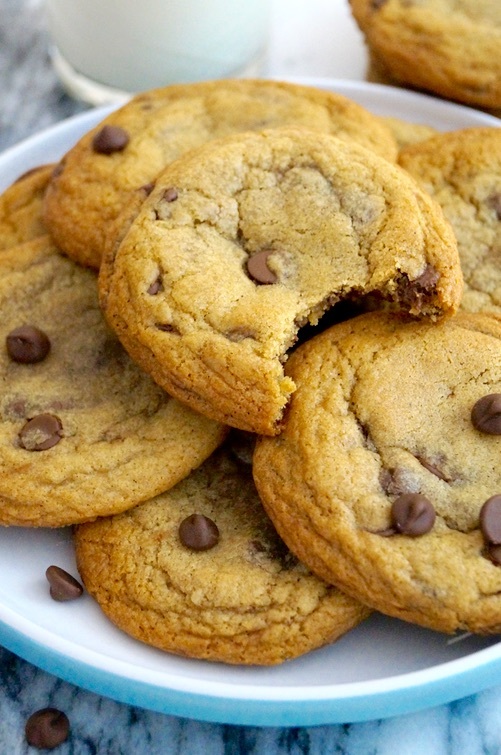 Chocolate chip cookies are the ultimate treat. I think we can all pretty much agree on that? The perfect cookie in my opinion has to be soft and with chewiness to it. I’m not a fan of big cake-y cookies, I like a slight crisp outside, but a chewy interior. I found the recipe for these delicious cookies when I was reading my friend Lilly’s blog post. She baked these cookies from Sally’s Baking Addiction (one of my fave blogs!) – they looked so delicious, that I had to try them out for myself! 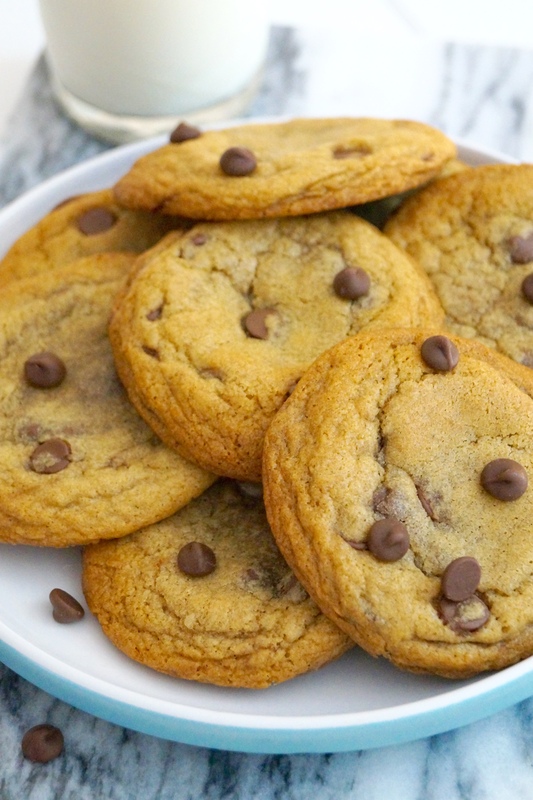 These cookies are simply the BEST chocolate chip cookies I’ve ever made and eaten. I’m so happy to finally find a great chocolate chip cookie recipe! Most the cookies I’ve made before have either been dense, flat and greasy from too much butter and way too sweet. I once even added too much chocolate – yes, you can go overboard with the chocolate! I don’t even want to admit the amount of cookie dough and cookies I’ve munched my way through to find this brilliant recipe! I love the addition of brown sugar in cookie dough – this brings a gorgeous caramel flavour to each bite. The other “secret” ingredient is cornflour (cornstarch), this guarantees the cookies are ultra chewy and soft – you must add it for the best CCC’s! Just a few teaspoons will make a whole lot of difference. I did my research and most sources suggested resting and allowing the cookie dough to chill in the refrigerator overnight. Overnight chilling not only adds to the flavour, but it will produce a thicker and far chewier cookie. It’s really tempting to bake the cookie dough straight away, but it is definitely worth the wait. Try it and you will see! I hope enjoying making and eating these as much as we did! Enjoy! In a small mixing bowl toss together the flour, baking soda, cornflour and salt until combined. In a smaller bowl melt the butter. Add the sugars to the butter along with the vanilla and mix together until combined, this will take about 2 minutes. Add the egg and egg yolk to the mixture and beat in to combine fully. Fold the flour in, and mix until the dough starts to clump together. Finish by folding through the chocolate chips. Be careful not to over mix! Place the cookie dough in a small bowl, cover with plastic wrap and leave to chill in the refrigerator for at least 2 hours. I made mine ahead of time and chilled the dough overnight – this is recommended. When you’re ready to bake the cookies, preheat your oven to 325°/160 Fan assisted. Take the dough out of the refrigerator and allow to come up to room temperature – this will take about 10 minutes. Portion the dough into balls – weigh for accuracy. Approx. 40g for each cookie. Now roll the cookie into an elongated shape – this will stop the cookie spreading out too much during baking. Line 2-3 large baking sheets. Spread the cookies out on the baking sheets. Bake for 10-13 minutes, or until the cookies are a light golden colour. Allow cookies to cool on the baking sheets for 2-3 minutes, then carefully transport to a wire rack to finish cooling completely. Best enjoyed with a glass of milk or sandwiched together with ice cream! Enjoy! If using salted butter, reduce the salt to 1/4 tsp. You can use a mix of milk and dark chocolate chips, if preferred. Chill cookie dough for at least 2 hours prior to baking, overnight will produce the best results. 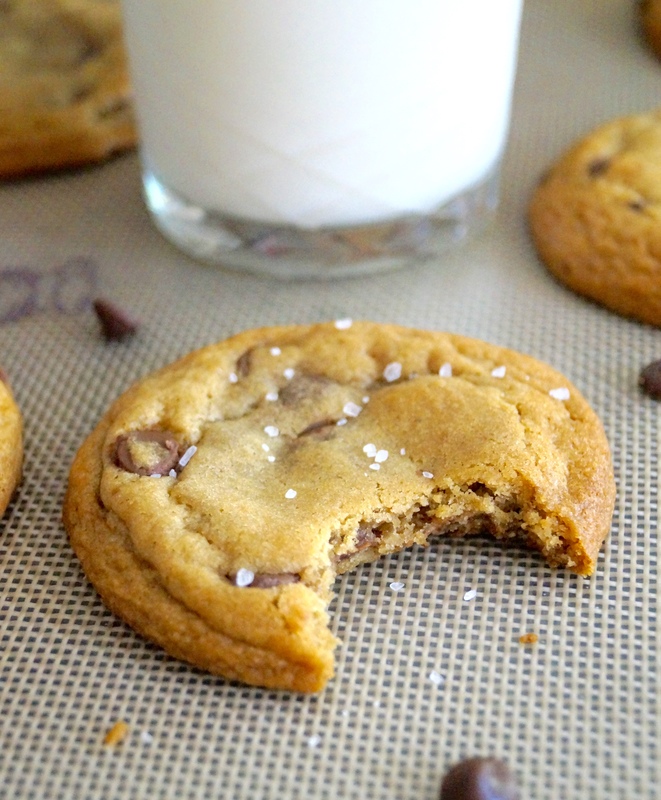 Serve with a glass of cold milk and you’re in chocolate chip cookie heaven!